The movie, despite its stellar cast of JENNIFER JASON LEIGH, CHARLES DURNING, and JASON MILLER, did little to hold the attention of our rambunctious class. Collectively, we groaned at the JONI MITCHELL title track (“Songs to Aging Children Come”) and I remember we were more interested in watching the commercial breaks than the movie itself. With the simple drop of a medical gown, a pre-teen chorus of thirty or so horrified gasps reverberated around the room. Needless to say, we watched the rest of the movie in disturbed silence waiting for another peek at JENNIFER JASON LEIGH’s emaciated ribcage. Instead we only got the death of a spunky, pre-THIRTYSOMETHING MELANIE MAYRON. 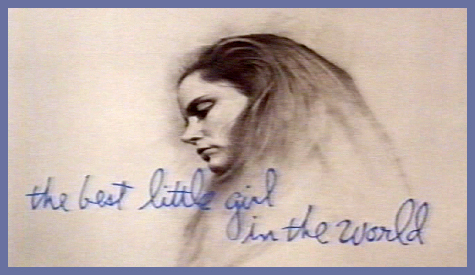 Long out of print, THE BEST LITTLE GIRL IN THE WORLD is currently available on YouTube starting HERE. Did anyone else have to watch this in junior high health class? Actually, we saw this in high school. Along with the one with Lea Thompson as the girl with the drinking problem and repressed memories of sexual abuse. I didn’t see this in school, but I remember watching it on TV. Yikes! I also watched The Karen Carpenter Story on TV. I think it came out in 1989. Have you guys seen SUPERSTAR the karen Carpenter story told with barbies from director Todd Haynes??? I was also gonna mention the Karen Carpenter As Essayed By A BARBIE Doll movie but someone else beat me to it. I was – no joke- riveted! I only saw this movie for the first time a couple of years ago. Yowza! Very effective, if a little dated. Lovin’ on JJL big time. She’s so amazing. Does anyone remember a spoof that was clips of this intermixed with the Exorcist? I swear it exists! Yes, our teachers made us watch this. But it was not surrounding Karen’s death….which was 1983, it was WELL before that! I actually saw this….before she died in 1981 when it was first released on tv, I think. I could be remembering this wrong, but wasn’t it a TV movie of some kind?